Hello everyone! I'm posting over at Twine It Up! with Trendy Twine today. It's a new month and our Twine this month is Pink Limeade. I just love this twist. I also used 2x8 Zip Bags, Spring Green Large Tag-It, and Raspberry Cupcake and Twisted Lime Sequins for a fun treat! I filled my 2x8 Zip Bag with chocolate eggs. These bags can hold a lot of treats! Next I picked out my Spring Green Tag-It so I could fit the cute Miss Kate Cuttable Easter egg file I cut from my Cricut using print then cut. 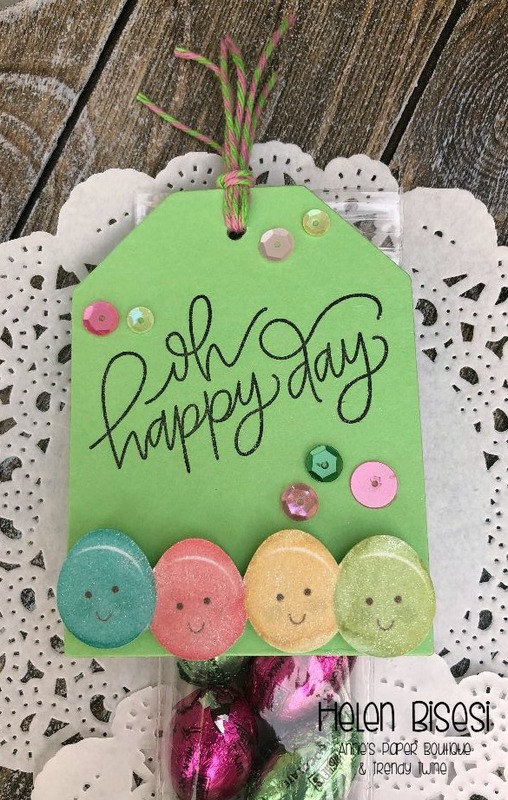 I stamped my sentiment and then used a Spectrum Noir Glitter Pen over the die cut eggs and the stamped message. Then I added my sequins from both mixes to match with the Twine colors.